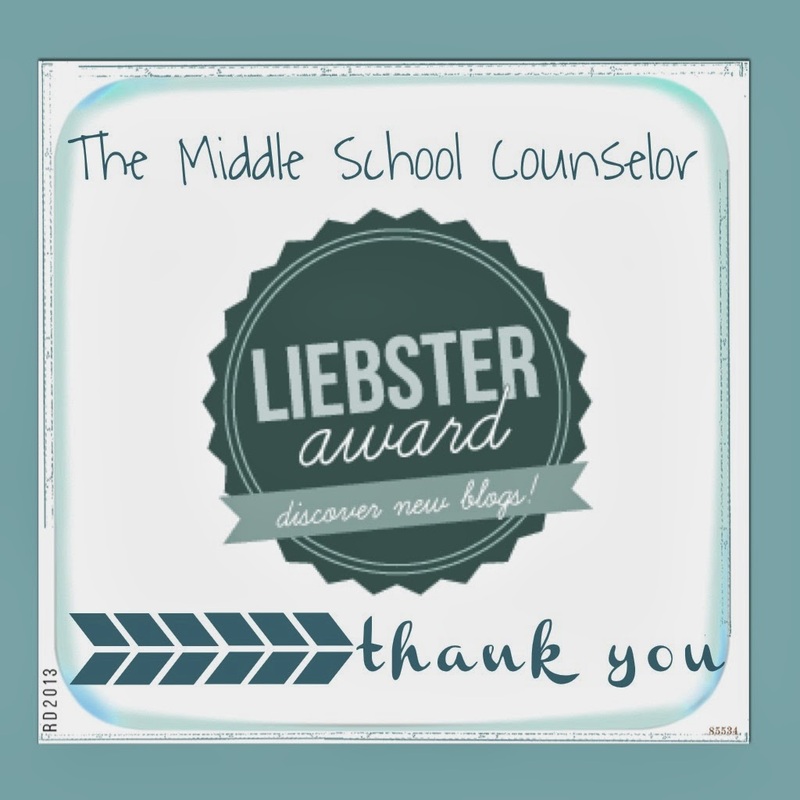 Franciene Sabens from the School Counselor Space Blog nominated me for a Leibster Award! But wait. . .it get's better, when asked what are her favorite blogs, Franciene listed mine as one of her favorites. Can you say HONORED!!!!!! Thank you Franciene. You are a dear friend and I can't wait to meet in person! Blogging over the past year has been wonderful. I have met so many great people and have learned so much. If you are learking in the shadows and thought of blogging, I encourage you to do so. You'll gain a lot by contributing. So, to get back to the conditions of accepting this award, let me start by answering a few questions. I started blogging because I was inspired by Danielle Schultz (School Counselor Blog) and Andrea Burston (jyjoyner counselor) and their blogs. I felt there was a need for a middle school focused blog and I also have been using the blog as a type of diary of what I am doing throughout the course of the year. 3. Share 3 things about yourself that most of your followers wouldn't know. I have twins in 4th grade along with my 6th grader. I have recently become a hockey mom, which although is fun to watch, has saddened me a little because I am no longer their soccer coach. I played soccer in college and love it, and although all 3 still play, they have decided to play spring hockey over soccer. . .
My house was built in 1813. It's old and we are in the middle of a remodeling project. I HATE remodeling! We do not have internet at my home. Weird, right?! The kids. They teach me something every day. 5. What would you be doing if you weren't in the School Counseling field? I would have probably went to medical school. In my junior year of college, I was very active in student activities on campus and the woman in charge of activities told me that she was trained as a school counselor. That was all it took for me to change my major. 6. What do you do for self care? I go to the movies. Really I do not stress about work that much. If something is bugging me, I might talk to another colleague (our school psychologist, Dana is great), but once I get it off my chest, I'm good. I don't hold on to a lot of things/stress/anger/etc for long periods of time. I determined long ago it just isn't worth it. 7. What are your top 5 tech tools? 8. What books are you currently reading? Who has time to read? Actually I read all the time, but it's usually work related and online. During the summer I do enjoy reading "stories" and read a lot of Jonathan Keller murder mysteries. 9. What's your guilty pleasure TV show? "You have 3 choices in life: Give in, give up or give it all you've got." 11. If you could live any where in the world where would it be? I am not sure. . .could I spend a week in each place and travel around? 5. Contact your nominees and let them know you nominated them. 2. Why did you decide to begin blogging? 3. Who do you follow on Pinterest? 4. Do you have a favorite counseling lesson? 5. How do you connect with other counselors? difficult if you had to do without? 7. What is your favorite thing about being a counselor? 8. What are 3 things about you most of don't know? 9. What is your favorite ice cream flavor? 10. What do you do in your free time? 11. What is your best piece of advice for a student? Can't wait to hear what everyone has to say! Carol, thanks for the kind words & mention in your post. I am flattered that my blog is one of your favorites! I love all of the fun & educational activities you do with your students. You are an exceptional & inspiring school counselor. Thank you for sharing your experiences & knowledge with all of us!